Pyrgos Blue is like the smell of freshly baked bread - homely, welcoming, enticing. 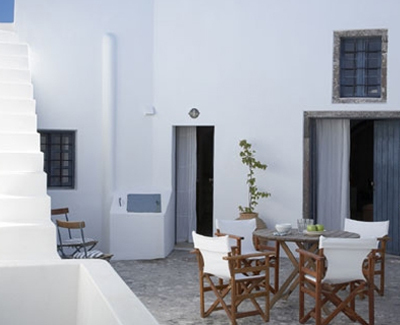 This traditional dwelling is the essence of what an island holiday home should be. It begins at the footpath leading to the house. Breathtaking island views frame the entrance as a large courtyard welcomes you with open arms. Enter the lounge area; with its traditional Santorinian couch and clutch of cushions, and you?ll be lured in further. There is an informal dining alcove for hearty family meals, and a well-equipped kitchen to prepare them. An arched passage way leads you to the sleeping quarters. The master bedroom is light and airy, with stunning Caldera views and double doors that open onto a second enclosed courtyard, featuring a private outdoor shower. The kids will be happy, too: there are two charming single bedrooms in the main house, and an additional double en-suite bedroom with its own private entrance. After a day exploring the island, light the barbeque in the courtyard, take a glass of local wine up to the roof terrace, and watch the sun sink over Santorini?s honeycomb of whitewashed villages. Trust us - you'll forget the very idea of stress.